The East Coast Hockey League (ECHL) has bestowed the highest honour it can on Corner Brook’s own Darren Colbourne by selecting him to be inducted into the ECHL Hall of Fame in 2015. After being drafted by the Detroit Red Wings in the 1988 NHL Entry Draft, Colbourne found himself in several semi-professional leagues. One of these was a fledgling league that has since blossomed into a feeder to the both the AHL and NHL. 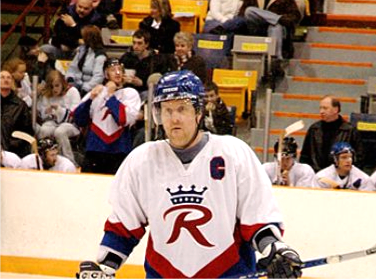 Spending a total of 7 seasons in the league spread over a 12 year period, Colbourne played for the Dayton Bombers, Richmond Renegades, Raleigh Icecaps and Augusta Lynx, accumulating 569 points, with 323 goals and 244 assists. In his time in the ECHL, Colbourne reached the 50 goal platform four times and in two seasons scored 69 goals. When asked about being inducted into the ECHL Hall of Fame, Colbourne remains humble but indicates that when you spend a lifetime playing the game you love, being recognized as one of the elite players in the league is a “great honour”. For hockey fans in the Corner Brook area who have watched Darren Colbourne play in the Newfoundland Senior Hockey League they have watched him score here. He has been one of the most consistent scorers and while in the ECHL never had a season with less than 30 goals. When asked about his time in the ECHL during an interview with the Corner Brook’s CBC Morning Show, Colbourne indicated if he never seen another bus or another pizza, it would be okay with him, as he talked about the life of living on the road. However, the lessons he learned during his time in the league have carried with him his entire life. He not only found out that it was hard to make it in the professional ranks but it was difficult to remain at that level. Those lessons have made him work hard during everything he touches in his career outside of hockey. Darren has no regrets in what hockey has brought to his life. He also offers some words of wisdom to the young players that want to explore a professional career. Colbourne says being a pro requires that you have an ability to either score goals or stop pucks and that you have to have the passion and determination to get you through the tough periods in your career. Staying focused during the ups and downs is key to the success and you have to be committed 100% to playing the game. Congratulations Darren on being inducted into the ECHL Hockey Hall of Fame. Here’s what Colbourne’s stats look like over his pro hockey career.